2019 is our 25th Muskoka Kids Triathlon. For kids to try a triathlon. Limited spots available for adults to try a Tri. Get notified about Muskoka Kids Tri news. 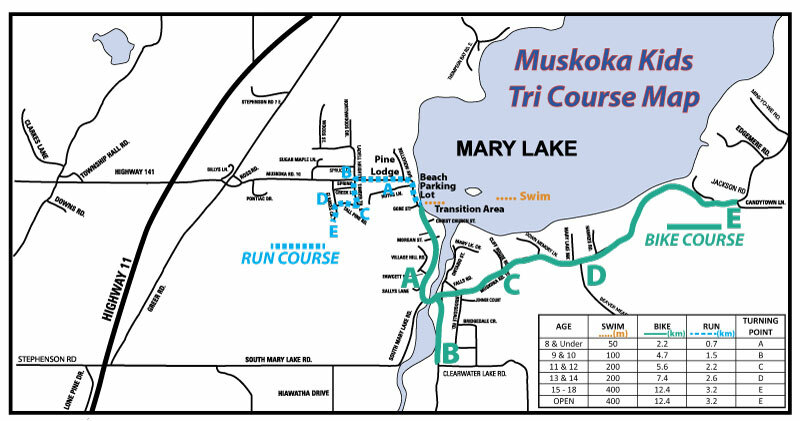 The Muskoka Kids Triathlon swim-bike-run fun challenge is open to kids young and not so young (ages 6-96) , with distances ranging between 50m swim / 3.2 km bike / 700m run for the 8 and under age group to 400m swim / 12.4 km bike / 3.2 km run for the 15 and older age groups. Age is based on the child’s age as of race day. Prizes are awarded to the top three male and female finishers in each of the age groups. IS THIS RACE RIGHT FOR YOU? The Muskoka Kids Tri is a fun race primarily for children. It is a wonderful experience for kids wishing to try a triathlon and can be a fun family yearly tradition. Participants in the adult categories are ideally parents of kids participating. They must be able to swim 400m without a life jacket. Each racer must finish ALL of the distances in order to complete the race. Race Kit Pickup is at the Port Sydney Community Hall. You can pick up your kit on Friday July 19th between 6:30 p.m. – 8:00 p.m. or Saturday July 20th between 8:00 a.m. and 9:00 a.m. All kits must be picked up at the hall by 9:00 a.m. Saturday. The hall is located at 607 Port Sydney Road in Port Sydney. Take exit 207 (Highway 141/Muskoka Road 10) from Highway 11, head east and follow the road around to just past the main beach. Free Bike Checks will be provided at the Community Hall Friday night. The bike check is optional but is beneficial to make sure your bike is in good working order. There will not be bike checks available Saturday morning. We will be hosting a Pre-race Seminar on Friday July 19th at 7:00 p.m at the beach. This seminar is optional but can be very helpful for first time “tri-ers”. We will review the course layout, the transition area, and offer tips for race day. Parking on Saturday is also at the Community Hall. You can stop briefly to drop your bikes etc. off by the transition area at the main beach then drive to the community hall. Volunteers will be on hand to direct you. Parking is not allowed on the race course roads. Dogs are not allowed in the beach area. Please make arrangements to leave your furry friends safely at home. Life Jackets are permitted for children in the swim portion of the event. The smallest age groups run through the water and are not in over their heads. We are excited to announce that the Muskoka Kids Tri is supporting the Muskoka Children’s Foundation in 2019. Please consider supporting their mission with a donation. The Children’s Foundation of Muskoka is an independent, non-profit organization formed in 1989 by volunteers in Muskoka. CFM raises funds in our local community, in partnership with individuals, businesses, and service organizations. We are also a community partner with Canadian Tire’s Jump Start Program. Be the first to hear about Muskoka Kids Tri News. Get access to early registration. Want to check and see if you are registered? Or wondering if a friend has already registered? You can confirm registration here. © 2017 Muskoka Kids Tri.